Decentralized Peer-to-Peer network blockchain ecosystem that allows manufacturers to save money on IoT device upgrades. In turn, users/owners of these IoT devices have the option of participating in the support of the entire P2P network and get ioeX coins as a reward. Users can even mine Bitcoins and ! simultaneously. Strong team, good idea, nothing questionable found. Our verdict: Not a scam, Approved! Architecture based on distributed networks — combining the Internet, IoT, and blockchain solutions. At this stage, they are offering the infrastructure itself and a platform for updating IoT devices based on this infrastructure. Standard for these types of projects one-pager site without accepting any data input - thus cutting down on security issues. Social activity and follower numbers are actually very impressive for such a young project (1 1/5 month old). The project's founder, Aryan Hung, gathered around himself an experienced group of experts. The core of the team worked at Foxconn at some point. No team member seems out of place - their collective experience 8-15 years. Note that the more experienced team members worked at Kortide, which morphed into Elastos Foundation — one of the main strategic partners of this project. All in all, looks like the team's professional capabilities are enough to deliver on their promises. Almost all of the project's consultants are from their strategic partners and vendors. The exception is Colin Cheng — Founder of FintechCPA, which is a rather well-known organization in Japan. The most noteworthy consultants here are Rong Chen, the founder of Elastos Foundation, and Simon Szeto, Director of SBI E2-Capital HK. We see no reason to doubt the competency of these consultants. Interesting that ioeX is financed by an investment from SBI E2-Capital. And it's also one of the first projects financed by an investment from EOS VC. On the downside, their website doesn't list team members' or consultants' social profiles (even though all of them have social media profiles). Another annoying thing is that not all of the team member names on the English version of the site are quite the same as their names on LinkedIn — this is common for Asian projects, but should still be corrected. Number of IoT devices is growing rapidly. Upgrades via OTA servers are too costly for manufacturers (both server and traffic cost). 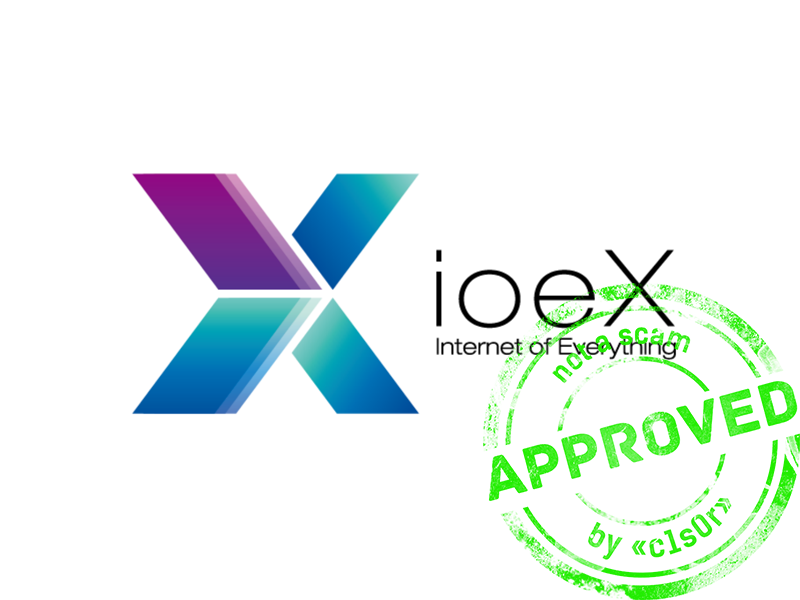 ioeX offers a "Decentralized Peer-to-Peer Network" solution. Such a network allows to maintain and relay content with minimal expenses. For starters, they're offering a solution for online updates. Eventually, will add new features. Of course, the IoT device market is growing in terms of both the number and variety of devices sold. Each such device needs periodic updates (for adding new functions, fixing errors, maintaining a high level of defense from hackers, etc.). Both the software and the firmware needs updating. When an update comes out, all the devices start updating automatically. This overloads the servers much like a DDoS attack would. There have been plenty of cases of servers shutting down because of big updates. Which adds repair costs. Adding multiple servers to handle the update volume also raises costs. With 5 million active devices and a 50Mb update, using network traffic cost of US$0.1/GB (Amazon Web Services), this one update costs around US$25,000. Frequent and bigger updates are thus very costly for a manufacturer. Even beyond updates, all IoT devices have to store and relay a lot of information to the network. When a user wants to contact an IoT device via the Internet, there are often direct access issues (multi-level routing, firewalls, NAT). Which forces manufacturers to launch and service relay launchers. Again, this is an additional cost. All of the above problems is what ioeX is offering to solve. ioeX is offering their Decentralized Peer-to-Peer Network to fix the above problems. (referred to as "Carrier" in this section). The network itself is built on Elastos (which merits a whole other review). What's this Carrier? It's this perfected Peer-to-Peer network. It uses nodes s peers. And communication is Friend-to-Friend. Initially, the network will not have trusted (Friend-to-Friend) relationships between nodes. Which allows them to avoid hacker attacks via direct network address. Since Carrier is a communication framework and does not have any application features or attributes - it doesn't store any information about users (like what and where is sent by a node). Instead, the node itself stores all the info. App developers can flexibly control all aspects of the Carrier. Any data passed through the network can be encrypted. It can be translated using UDP packet-like mode (active by default) or TCP-like streaming mode - depending on an app's need. To transfer large files, developers must provide support to the Socket through own application (if they want interrupted downloads to be supported). All user APIs are asynchronous — which allows to initiate many operations without blocking or waiting for any operations to complete. The process can retrieve the result of an operation later or when it receives a notification of its completion. If a node cannot connect directly to another node, it's assisted by the Bootstrap Node, which acts as a Relay node. Carrier will choose the optimal route to transfer a file between nodes, including relay nodes (Bootstrap Nodes). Regular nodes don't store locally a list of all the Bootstrap nodes, just the nearest. UID acts as an indentifier in this network. The white paper indicates that if User B gets the same UID as User A, he will not be able to receive access to all the data of User A. To do that, B would have to establish a trusted relationship with A. The Carrier ID generated it first appears in the network is a public key corresponding to a key on the ECC Curve. All connections and transfer of data is encoded end-to-end between the nodes on each side. Carrier does not support offline messaging. Using the functions of Elastos, the team hopes to develop cross-network application. ioeX will contain a number of large-scale self-operated seed bootstrap nodes and seed peer nodes to provide peer-to-peer networking functions. 4) Every update file will have its own address in the network. 5) The manufacturer initiates the process of updating its devices. 6) Randomly selected devices download the updates from a random address (until all devices that need the update are updated). 7) The device is updated. This uses IPFS and so the update file is stored - in pieces and encrypted - on multiple seed peer nodes, which is safe. Equipment manufacturers can build-in support for P2P software during production. The target audience are the manufacturers of IoT devices. The White Paper indicates that ioeX is in negotiations with the leading manufacturers of various hardware (including Realtek and Mediatek). Later, they plan to work with Cisco, Fujitsu and Huawei. The team hopes that large e-commerce systems will want to integrate P2P networks incentivized by crypto. Which will add more Bootstrap Nodes to the system. And distributing apps to cell phones will allow any phone to become a Peer node — adding more Peer Nodes to the system. The platform will use blockchain technology. In this blockchain, they will record, for example, the amount and time of bandwidth. Node reward size will be based on this data. Through strategic cooperation with Elastos to share Bitcoin computing, the Bitcoin miner can generate additional rewards by simultaneously mining ioeX without extra costs in the mining process. To support the mining credit line, ioeX issue will increase by 3% every year. To keep the price of ioeX steady, the company will use 25% of its profits to periodically repurchase ioeX tokens. To protect users from falling prices of ioeX and to pay for services within the platform, they will use GAS. GAS is fixed at US$1. Exchange from user's ioeX wallet with ioeX coin. Others may transfer GAS from their ioeX wallet to user's wallet. Exchange ELA (Elastos coin) for GAS from the ioeX wallet. Become a bootstrap node or peer node of a P2P network and obtain the award quota by providing P2P network services. Reward amount will be announced after the ICO. ioeX token holders can exchange them into GAS. 10% will be held by team members in sealed state for 30 months and gradually released every six months. 2% will be used for promotional incentives as marketing expenses for project promotions. enable ioeX cryptocurrency reward mechanism. throughout Asia, Europe, Americas, and Australia. ioeX P2P network will begin the project to incorporate IPFS function. At the start of 2019, they will plan additional milestones. Everything is logical and to the point. No big questions for the project. Plenty of illustrations for easy practical understanding how everything will work. On the downside, there's a lot of repetition in the text — same things explained over and over. Makes the White Paper a bit long and confusing. Some points are hard to fully comprehend. The Taiwan and Chinese versions leave the last two pages completely empty — strange and not professional. Q: "For sealing terms please refer to Appendix 1" Where is this Appendix? Didn't find it in the White Paper. Q: Will the new updates work a la uTorrent? If not, why? It would speed up upgrading all of the devices without overloading the network. Strong team. Their significant experience will play a role, and the project will be useful. The idea itself is quite real. All aspects of making it work are described well in the White Paper (even though confusing at times). No big problems or questions for the project. Although such a team and infrastructure could do a lot more than mere "IoT updates." So waiting for new ideas and their implementation in 2019.